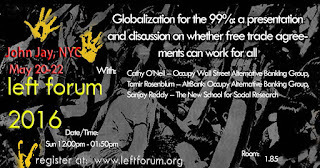 I'm pleased to have coordinated this panel for Occupy's Alternative Banking Group at the Left Forum for Sunday, May 22 at noon. You can read the article on which the discussion will be based at the HuffPost. I'm eager to hear what Sanjay Reddy has to say about it. The moderator, Cathy O'Neil will be brilliant as always and Tamir has one of those surprising minds that cannot live in the box. Registration is required, but volunteers attend for free. Occupy's AltBank (Alternative Banking Group) has produced a critique of both the content and process of international free trade agreements driven by the interests of the global 1% instead of the interests of the global 99%. The critique will be presented by one of its authors, Tamir Rosenblum. 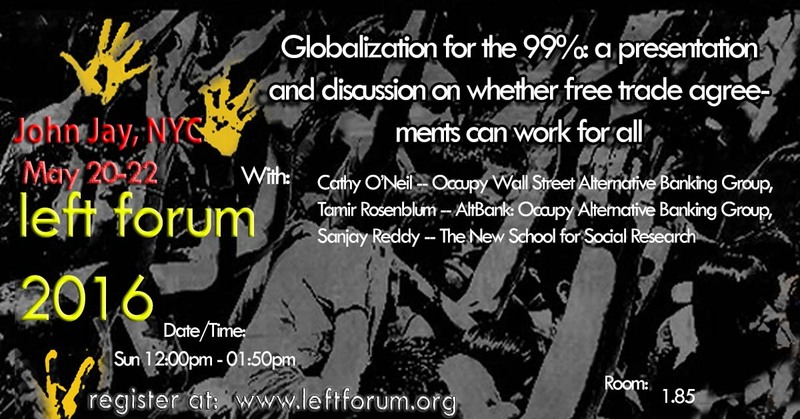 Economist Sanjay Reddy of The New School, who has written on international trade and labour standards, will respond. The discussion will be moderated by mathematician, big-data critic, author and activist Cathy O'Neil.